Playing truant from the self. An essay on creativity by Philip Battle. “I’m a creative person“ is usually a statement made by a person who once drew a realistic portrait or wrote a couple of lines of poetry at school, and looks back with fond nostalgia on a creative self that could have been…..if only. But ask the teacher; “How do you get a Giraffe into a refrigerator?” and what would the answer be? Well perhaps you just open the door and put the Giraffe in. OK, then one supposes you would do the same if you wanted to put an Elephant into a refrigerator? NO, NO, NO, that’s a whole different kettle of fish; firstly you would have to take the Giraffe OUT and THEN put the Elephant in! You see being a creative person has nothing to do with ‘getting things RIGHT’; in our world there is no such thing as right or wrong. All that’s required is a ‘childlike’ playfulness of mind. Schools and the education machine do a pretty damn good job of knocking these qualities out of people. So by the time you become an adult, you say stupid things like: “I used to be good at art!” and “I wish I could write poetry!” But that’s the thing you see, as adults, we just stop believing that we are creative people. Creativity is something that other, more talented people do. And that’s the nub, if we don’t believe, we don’t become. Life is a bit like that when you think about it, I mean; what separates a tramp from a successful millionaire business man or woman? Who taught the cavemen to do art? Indeed, everybody can be creative in life, in every aspect of living, it’s a matter of regaining that flexible and playful thinking that we use to practice as children, before we became processed by the education machine, full of noughts and ones, rights and wrongs….the problem with this model is that the universe doesn’t work on binary code. You don’t have to draw, paint, sing or dance; you just need to start believing in your creative self, remove the blockage and play the truant from yourself. YES, but HOW do I do it? WHERE do I start? Well they often say a change is as good as a rest, holidays are great, and we are always playful on holiday. 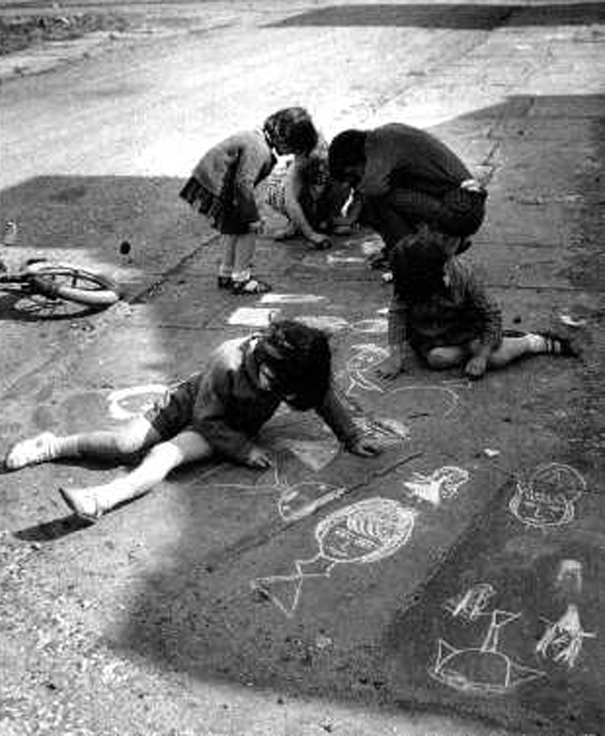 Talking about your creative self to a sympathetic friend or partner and playing like we did as children. You see, kids don’t think about this stuff, creative thinking is a natural part of their development as human beings. Nobody taught cavemen how to do art, but when Picasso came out of a cave in the south of France and made his famous statement “We have learned nothing!” he was right. You see the problem is that the education machine has got you in its grip. You’ve become binary conditioned and moulded into a good citizen. Conforming to make money; support the economy and bring up baby. It’s not exactly rock n’ roll but just imagine; what would happen if we were all free thinking, creative individuals who questioned everything, including the status quo. There would be anarchy, now there’s an original thought for you. It’s no coincidence that the most creative individuals on this planet are the ones who flunked at school. It’s in society’s interest to knock creativity out of you. In fact, come the revolution and it’s the creatives and free thinking individuals who are the first to be bumped off…..they offer the greatest threat to any regime. Woooh…..How did that happen? Well the greatest form of creativity surely is destruction, think about it, destroy the past and create a new history and future. I seem to remember that great original thinker and artist Adolf Hitler tried doing that and look what happened to him; OK, bad example, and perhaps we don’t need to go that far, but it just goes to show what can happen to an artist if you undervalue the creative self! FACT: Most people resent creatives. They resent that they are being paid to ‘have fun’ and paid to do creative stuff, while most of us are stuck in the hovel of a dead end job doing something we’d rather not be doing, just because we ‘fell into it’ Born to fail. Oh, how I wish my life had been different….If only! 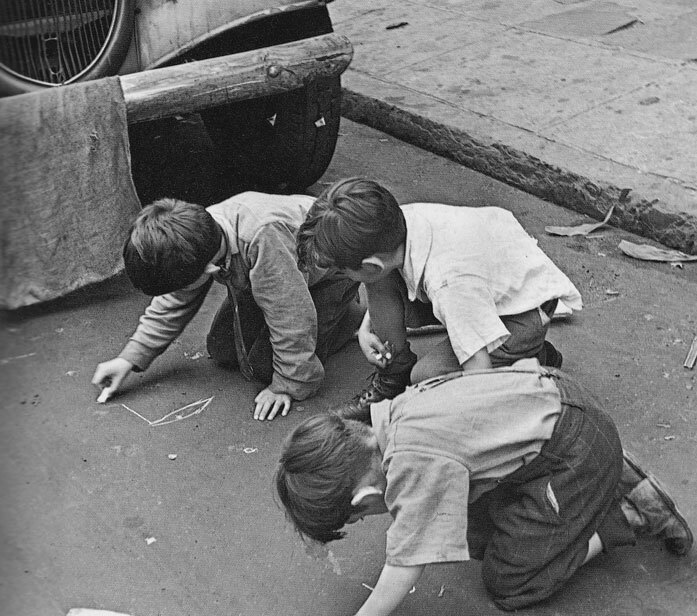 Children in Creative play: New York 1937, Photo by Helen Levitt. So what’s the big deal about creativity? Well its simple really: CREATIVTY EQUALS LIBERTY. That’s it; the freedom to express and create makes us feel good. It removes the shackles and drudgery from everyday life. It makes us feel good about ourselves and the world around us; I would say it wasn’t so much a religious awakening, more like a personal journey of discovery. For every creative act is a new learning experience. Not about noughts and ones, rights and wrongs, but about the self & ultimately for the self. It’s probably the best form of therapy you could ever imagine. And that’s why I do art! Never put yourself down or tell yourself that you can’t do it: Belief in your own sense of ‘the creative self’ is essentially the key. The most creative people in this world are only creative because they believe it. Over time, belief will remove the blockage, trust me! Never listen to anybody who tells you that ‘you can’t do it’ If you want to do it, you WILL do it. Never make negative comments about yourself through your lips. Saying things ‘out loud’ can somehow make them more real…..write them down, put them into a blog or letter and turn a negative thought into a creative act. Remember feelings change like the wind. Play truant from yourself: do something different, physically go to a different place, and experience something new. In life the journey is far more important than the arrival. Become a child again: Remember those long, carefree days of childhood, when the summers used to go on forever. The days we used to lay on our backs, drawing pictures in the clouds. THAT’S CREATIVITY FOR YOU! Remember, the sweetest dreamers are always wide awake! 27 Jan	This entry was published on January 27, 2012 at 4:14 pm. It’s filed under arts, blog, culture, Ramblings, street art, writing and tagged 2012, art, artist, artists, arts, battle, canvas, chalk, chalking, chalks, city, creative, creativity, culture, liverpool, pavement, philip, street, thinking, uk, urban, urbancanvas. Bookmark the permalink. Follow any comments here with the RSS feed for this post. Oh my God, thankyou! This was fun. I have one question. I always start making formulae for staying happy once I experince happiness…what do i do to get rid of this? why to stop, aishanor? does it bother you? how is it a problem?